Tom Roberts painted 'The Golden Fleece' while staying at Newstead Station in the New England tablelands of northern NSW. It is part of a series in which Roberts payed homage to rural life and pastoral industry, and captured vanishing traditions such as the use of manual shears. Originally called 'Shearing at Newstead', this painting was renamed to reference the Greek myth in which the Argonauts voyage to the end of the world in search of the Golden Fleece. The title reflects Roberts' creation of the rural worker as 'hero', and his evocation of Australia as an Arcadian land of pastoral plenty. The work's frame is attributed to John Thallon, the famous 19th-century Melbourne carver and gilder, and was restored in 2010. Signed l.r. corner, red/brown oil "TOM ROBERTS.". Dated l.l. corner, red/brown oil "... 94". Julian Ashton., Daily telegraph , ‘National Art Gallery: The Australian Court’, Sydney, 27 Sep 1905, unknown (illus.). Rob Ditessa', Artist's palette , 'Icons on show', pg. 54-59, Sydney, 2000, 57 (colour illus.). John Dunn, Outback , 'Legends of the outback: Australian painters inspired by the bush', pg. 72-78, Neutral Bay, Jun 2004-Jul 2004, 75. Deborah Edwards, Stampede of the Lower Gods: Classical Mythology in Australian Art , 'The Antipodean Arcady / 'When Pan purloined Apollo's lyre'', pg. 8-31, Sydney, Sep 1989, 31. Ali Gripper., The Sydney Morning Herald , 'Great art starts with the framework', Sydney, 04 Aug 2000, page unknown. Article about restoration of frames for the 'Australian Icons' exhibition and features a photograph of Installation Crew with 'Holiday in Essex'. Janet Hawley, Good Weekend , 'Tom Roberts Bailed Up', pg. 32-39, Sydney, 24 Feb 1996, 33, 36 (colour illus. ), 37, 39. Bruce James., The Australian , 'Review of Books', Sydney, 11 Dec 1996, 14-15. Bruce James, Art Gallery of New South Wales handbook , 'Australian Collection: Painting and Sculpture', pg. 102-181, Sydney, 1999, 118 (colour illus.). Nigel Lendon, Australian art and architecture: essays presented to Bernard Smith , 'Ashton, Roberts and Bayliss: some relationships between illustration, painting and photography in the late nineteenth century', pg. 71-82, Melbourne, 1980, 78, 79 (illus. ), 82. John McPhee, Australian art collector , 'Eye for an eye: the art of appreciation', pg. 98-101, Sydney, Apr 2000-Jun 2000, 98 (colour illus.). Humphrey McQueen, Art Monthly Australia , 'Positions vacant', pg. 21-23, Canberra, Sep 2000, 21. Review of the 'Australian icons' exhibition. Denise Mimmocchi, Australian Collection Focus: Sydney Long - Pan , 'Sydney Long: Pan', pg. 1-12, Sydney, 2009, 6, 7. Geraldine O'Brien, The Sydney Morning Herald , 'Shear genius: festival goes for gold', pg. 11, Sydney, 13 Apr 1996, 11 (illus.). Barry Pearce, The Weekend Australian , 'Time makes its judgment', pg. 2-3, Sydney, 12 Aug 2000-13 Aug 2000, 2 (colour illus.). This colour supplement is a 'Review Special' published for the 'Weekend Australian'. It consists of a four-page, colour wrap-around for the 'Weekend Australian Review'. 'The Australian' was the media sponsor for the AGNSW Exhibition 'Australian Icons', for the Olympic Arts Festival 2000. Barry Pearce, Art Gallery of New South Wales handbook , 'Australian', pg. 13-35, Sydney, 1988, 18 (illus.). Barry Pearce, Australian art: in the Art Gallery of New South Wales , 'Introduction', pg. 10-16, Sydney, 2000, 13, 37-38, 60 (colour illus. ), 302. Jo Anne Pomfrett, Insites , 'Conservation: Newstead homestead', pg. 9, Glebe, Summer 2004, 9. Ron Radford, Tom Roberts , ‘The Father of Australian Landscape Painting?’, pg. 10-19, Adelaide, 1996, 10, 82, 90, 96, 100, 104, 106, 112, 116, 120, 124, 138, 206. Andrew Stephenson, The Sydney Morning Herald , 'Tom's people', pg. 3, Sydney, 09 Jan 2001, 3. pg. 3 of Summer Metropolitan section. Annette Tapp, Federation: Australian art and society 1901-2001 , 'Weighing the fleece', pg. 103, Canberra, 2000, 103. Daniel Thomas, Art Gallery of New South Wales Quarterly , 'Tom Roberts', pg. 466-487, Sydney, Jul 1969, 472 (illus. ), 473. Daniel Thomas, Wool in the Australian imagination , The Golden Fleece: wool in Australian art', pg. 60-71, Glebe, 1994, 66, 67 (colour illus. ), 194. Australia Explored by the Great South Pacific Express , 'Arts of Australia', pg. 32-35, Australia, 1998, 34 (colour illus.). Ecological pioneers: a social history of Australian ecological thought and action , 'Seeing the land in a new light: people and landscapes in Australian art', pg. 34-71, Cambridge, 2001, 48. The Australian , Sydney, 28 Sep 1996, 24, 26-27. Tom Roberts Art Exhibition. Tom Roberts Festival 2001 , Inverell, 2001, 11. 1901: Australian life at federation: an illustrated chronicle , 'Riding on the sheep's back: the wool industry', pg. 51-57, Sydney, 2001, 53 (colour illus.). Tom Roberts , Sydney, 1996, 382-3, 388, 433-4. Economic Activity: Issues and Economies , South Yarra, 1996, 273. Tom Roberts , Sydney, 1996, back (colour illus.). AGNSW Collections , 'From Colonialism to late Modernism', pg. 7-106, Sydney, 1994, 8, 16 (colour illus.). Work through the eyes of artists. , England, 1993, 36 (illus.). 10 Masterpieces of Australian Painting , Sydney, 1993, (colour illus.). Veranda: Embracing Place , Pymble, 1992, 151-2 (colour illus.). The families of William Henry Lowe and Keziah Lowe nee Mansfield of Inverell - Swanvale - Glen Innies: compiled by their grandchildren , 2003-2004, 1 (colour illus.). 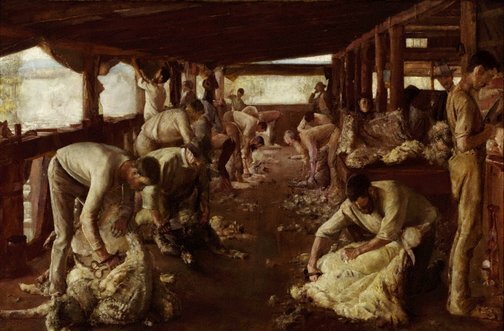 William Henry Lowe is the shearer standing third on the left in the painting 'The Golden Fleece'. This family history was compiled by his grandchildren, Val Sharp (Newcastle) and Doug Colley, 2003-2004. SOSE alive 3 , 'Australian perspectives', pg. 84-87, Milton, 2004, 84 (colour illus.). Images in opposition: Australian landscape painting 1801–1890 , 'Contrasting lights', pg. 135-154, Melbourne, 1985, 150. Encyclopedia of Australian Art (Vol.1, A-K) , Hawthorn East, 1984, 604-605. Portrait of a Gallery , 'Australian Art in the Old Courts', pg. 24-37, Sydney, 1984, 34, 36 (colour illus.). The shearers , Melbourne, 1982, cover (colour illus.). Parade , 'Tom Roberts: father of Australian landscape painting', pg. 25-27, Sydney, Apr 1973, 25, 26, 27. The art of Australia , Melbourne, 1970, 57. Art Gallery of New South Wales Quarterley , Sydney, Jul 1969, 472-73 (illus.). The golden age of Australian painting - Impressionism and the Heidelberg school , Melbourne, 1969, 62 (colour illus.). Corowa Free Press , 'Old painting found at Corowa', Corowa, 02 Apr 1963. Author and page unknown. Paintings of Tom Roberts , Adelaide, 1962, 5. A catalogue of Australian oil paintings in the National Art Gallery of New South Wales 1875-1952 , Sydney, 1953, 175, 176. titled 'The Golden Fleece' (called 'Shearing at Newstead' in the Cat. of the Art Soc. of N.S.W. An. Ex. 1894). Art in Australia [series 3, no. 70] , Sydney, Mar 1938, 40 (illus.). Tom Roberts: father of Australian landscape painting , Melbourne, 1935, 32. Fifty years of Australian art 1879-1929 , New South Wales, 1929, 17 (colour illus.). Catalogue: British Empire Exhibition (Wembley) 1924 , 1924, 97. titled 'The Golden Fleece'. National Art Gallery of NSW: illustrated catalogue , Sydney, 1906, (illus.). The Bookfellow: a monthly magazinelet for book-buyers and book-readers [no. 4] , Sydney, 29 Apr 1899, 28. The Sydney Morning Herald , 'Australian art in London', pg. 7, Sydney, 12 May 1898, unknown. Review of Australian painting exhibition held at Grafton Gallery, London. Society and environment for Western Australia 2 , 'Australian perspective', pg. 36-39, Milton, 2005, 36 (colour illus.). The people in the paintings: a research report for the Art Gallery of New South Wales , Inverell, 2006, 1, 2, 5-36, 6 (colour illus.). Tom Roberts Festival 2006: Heritage tour , Inverell, 2006, 3, 21, 30, 31 (illus.). Art of Australia. Vol 1: Exploration to Federation , ‘Individual and national feeling’, pg. 545-610, Sydney, 2008, 580, 581 (colour illus.). Sotheby's Melbourne: Important Australian Art, 25 & 26 August 2008 , Australia, 2008, 47, 48 (colour illus.). Related work 'Shearing shed, Newstead', lot no. 20. Daily Mirror , 'Artist gave life to spirit of Australian bush', pg. 24, Sydney, 20 Jul 1978, 24. Heritage NSW , 'Conservation of a woolshed', pg. 14, Parramatta, Oct 1999, 14 (colour illus.). Special focus on rural heritage in NSW and the conservation of the Newstead North woolshed where Tom Roberts set 'The Golden Fleece'. White Aborigines , 'The Bad Conscience of Impression', pg. 52-73, London, 1998, 62, 63 (illus.). Australian artist , 'Australian Icons at the Art Gallery of New South Wales', pg. 4-5, Chatswood, Aug 2000, 5 (colour illus.). Eyewitness travel guides: Australia , 'Botanic gardens and the domain', pg. 100-111, London, 1998, 107 (colour illus.). Art Connections , 'An example of writing using the social and cultural analysis plan', pg. 50-52, Port Melbourne, 1998, 49 (colour illus. ).